So you’ve had a few sessions with your therapist and they introduce to you the concept of journal therapy. Their goal is to keep a log of your progress, feelings and emotions to help further your reflections on your condition as you go through it as well as to create actionable ways to combat reactions. Week to week, chances are your therapist will lack insights into how your condition affects you and this can be very useful once in the hands of a practitioner. Journals have been used for many years to help a running log of a person’s life or emotional state and the popularity of journals is only growing as their reputation spreads. Journal therapy is very similar to the popular technique of talk therapy used by many therapists to help you express your emotions by vocalizing your experiences. We’d like to recommend a few ways that you can start using a journal to master your day. These are all recommendations and advice for newbie journal users. Let’s dive in. Your first few entries will be difficult, what do you write about…?! And how do you go about writing it? One of the best starting points is to date your piece. This simple and routine task will help to determine the date to which you’re writing on and will help you in the future to see the progress you’ve made. Many people start their first entry off with a short outline of why they’ve been asked to create a journal. This is a very open way to begin your journal and can help set the tone. After this introductory piece, the first entries will be easier to write. Writing up your feelings and emotions can be a good starting point, whatever stage you are in treatment. The act of journaling is to be reflective but also present, so sharing your current state of mood can help towards building the best outline of you journal. From positive to negative emotions, making sure to log all entries to how you feel will capture all of your moments. Covering all of your potential drawbacks to the best of days, the journal will give your future self a view into your thought process. This can be extremely valuable as you reflect on your condition and ever feel the need to understand or look back on your emotional state later on. Making sure you complete your journal on a routine basis during treatment can be tricky, with all of the many other things to do during your day, it’s another to add to the list. Setting a simple routine reminder on your smartphone or using the reminders of your journal app, can help you to not forget when you have to fill in your journal entry. Now, you’re sold on journal therapy, let’s dive into some useful tips for making the most of your journal. Using an attractive journal will make writing a lot easier to come back to as a habit. Thanks to the digital world that we live in today, it doesn’t have to be a physical notebook. There are plenty of ways you can log all of your emotions and thoughts digitally, securely too. The smartphone in your pocket can become a tool for collecting those valued moments for later analysis. If you’re looking for a strong journal application, we’d recommend our own, Therachat. Using this free, secure journaling tool with journal activities created by therapists, you can collect emotions, thoughts and document your state through this application. It’s recommended by many therapists and comes with built-in reminders. An added bonus for your schedule means, your smartphone is portable and easily accessible allowing you to add notes at any time of the day. 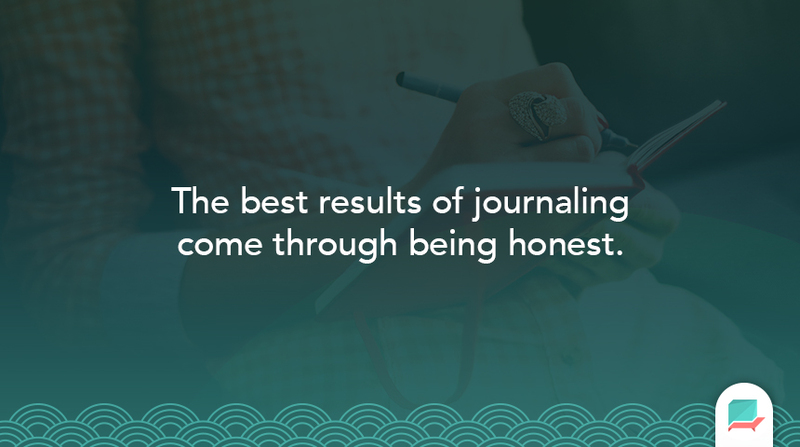 The best results of journaling come through being honest. Inside of your journal, being as clear as you can with your emotions is valuable. 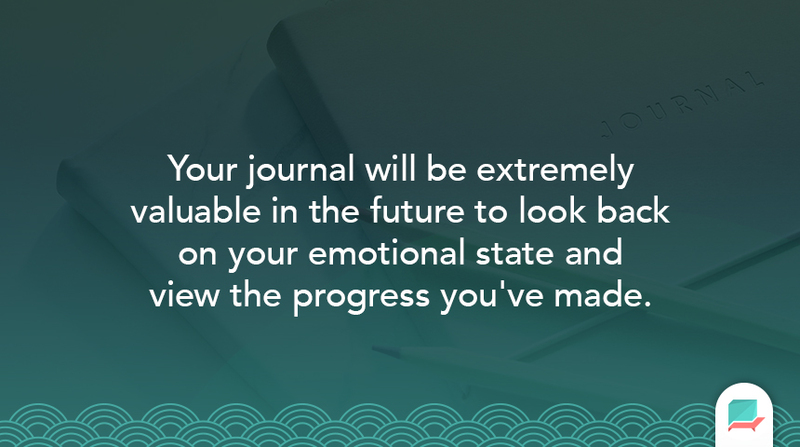 Honesty in your journal breeds an opportunity to truly reflect on your emotional state. This open approach to your journal will help in real-time by providing you with the effective way to reflect on the events of the day or your feelings at that current time. Getting started could be much harder when you need to be reflective. There are a host of prompts that can be made available through your therapist or even online allowing you a strong starting point to kick off your entries. Here’s a great list of journal prompts to get you started. One of the recommended times to enter into your journal is in the mornings. This potentially quiet segment of your day provides a window to add to your journal, distraction-free. Many journal takers love to enter their thoughts during this period of the day, after a long sleep allowing them a feeling of creativity to kick off their day. A popular author and leading podcaster, Tim Ferriss recommends to start off your journal practice in the mornings for 15-minutes. With a cup of tea or coffee, he’ll sit down and enjoy his practice reflecting on his thoughts at that current moment. Of course, you are able to enter entries multiple times during the day, however, a morning entry could push start your day with a sense of control by reflecting on the day before, or the day ahead. Your journal is a place to reflect. Once you get started, the practice is yours to adapt. 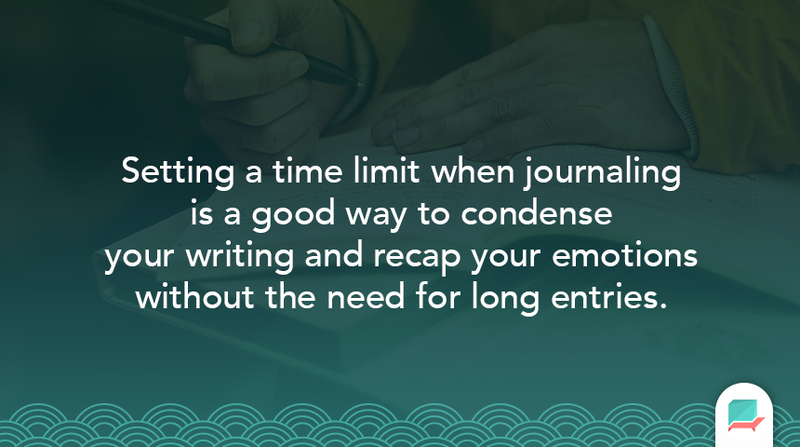 Setting a time limit for your entries is a good way to condense your writing and recap your emotions without the need for long entries. Many journal fans use time limits to keep things simple, setting a timer between 10 – 20 minutes long as a guideline to freely write about their emotions. If you see yourself as a slow writer, not a worry, set the timer to 30-minutes. This has helped many of those journal users to keep on task and express all of their experiences in a healthy piece of writing. Your journal practice will get stronger and stronger over time. Taking your journal with you across the day is important. Capturing the stressful moment, concerns, and experiences will help to provide a window of control and venting. A lot of journal users love to have a portable journal in their bags to grab at any point to share all of their experiences. Coming back to remind yourself to do your journal. A recommendation is to download a popular task manager like Todoist, or even Reminders on iOS to set recurring daily reminders on a routine, like journaling. Or you can use the built-in reminders a lot of journaling apps offer. This will help reduce stress around making sure you are taking the time to do this. We’d recommend going with what suits you best. Many people use notebooks, others have migrated towards the digital applications. Digital tools can be scary. The act of downloading an application, writing on your iPad feels very alien to those who love the feel of a notebook, but it can appeal to many lovers of technology because it comes with added benefits of all entries being available 24/7, having built-in reminders and many more. There are a host of digital journal tools available now for your iPhones and Android phones making your practice portable to wherever you go. The power of your devices allows you to add photos, videos, day information and much more about your day to your journal entries. If you’re a tech lover and following therapy, you can also recommend to your therapist. Through Therachat your journal entries will immediately be shared with your therapist so they can follow you in between sessions and provide actionable feedback, giving you the best result from entering into your journal. So whether you’re keen to use your journal on your iPad or on a fresh-new notebook, it all works! How can your Therapist use your journal entries? Bringing your journal to treatment will help your therapist towards tailoring the session. Remember your therapist isn’t going to be there during the week so they will not know about all of the experiences that you encountered. Like with anything new, journaling will become easier to adapt to your daily routine. Making sure you add your entry will slowly become a habit, and your pieces will evolve into a fluid piece of writing perfect for assessment from your therapist if that’s the path you choose. Rounding up, through the use of a journal, will help to fill in the gaps and help to customise future sessions with you accordingly. For many therapists, clients (you) having a journal is a perfect way to enhance your treatment and further extend your homework to benefit your condition. Journal therapy is one of the many helpful resources for those suffering from mental health issues as it helps to develop a healthy routine of reflection and documentation. Make sure to follow along with our Blog to keep updated with all of the journal-related advice you need! Let us know in the comments below about whether you’ve ever tried a journal or have considered it? Or if you’re a journal pro, feel free to share what works for you!